What will you do if you have to arrange a large number of books in your book-rack? You’ll categorize your books in different genres and then put them accordingly, isn’t it? What if you have or going to have a large number of posts on your website? Wouldn’t you like to arrange them in some way? 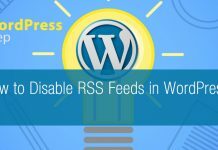 Yes, to address this condition WordPress allows you to put your posts in different categories. 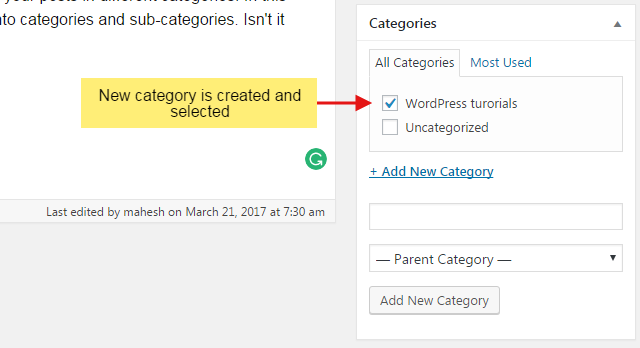 In this tutorial, we are going to learn how to organize your WordPress posts into categories and sub-categories. Isn’t it great? Let’s get started. 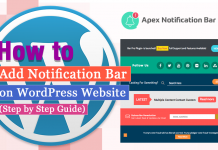 Login to WordPress dashboard. Click on the Posts >> Add New menu. In the right sidebar of Add New Post page, you can see you can see a widget named ‘Categories‘. 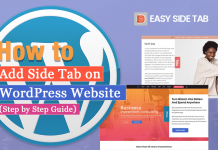 For this tutorial, I’m working in fresh WordPress site which has no custom created categories. It has a default category named Uncategorized only. Click on ‘+ Add New Category‘ to add new category. Enter the name for the category and click on the ‘Add New Category‘ button as shown in the following screenshot. New category is created and automatically checked. Uncheck ‘Uncategorized‘ category. Likewise, you can create other several necessary categories for your website and select the one which fits best for your post. Click on the Post >> Categories menu in your WordPress dashboard. You will reach to the Categories page. Enter the name for your category in the ‘Name’ text field. You can choose the slug for the category as well in this method. Enter the slug for the category if you want it to be different from its name. Remember, slug must be unique (shouldn’t be used before in your site for any page, post or another category). Description isn’t compulsory. If you wish, you can add in the textarea of Description. Finally, click on the Add New Category button. A new category is created and is available for the use. If you have been using any category for a long time, it’s not the good idea to change the slug of the category. Changing the slug will make all links under it to become dead. It can seriously affect your SEO ranking as well. If you really have to do it, take expert help to do link redirections for the existing links related to the category whose slug needs to be changed. But, there can also be the case in which you may have mistyped the name of category or slug. Have you noticed that I had misspelled category name for ‘WordPress tutorials‘ when I created it? In such case, you certainly need to edit and correct the category. Now, let’s learn how to edit it. In the Category page, you can see all the categories on the right side. Find the Category that you want to edit and click on the Edit as shown in the following screenshot. You’ll reach to the Edit Category page. Edit the name and Slug. Your category is updated with changes you made. Congratulation! 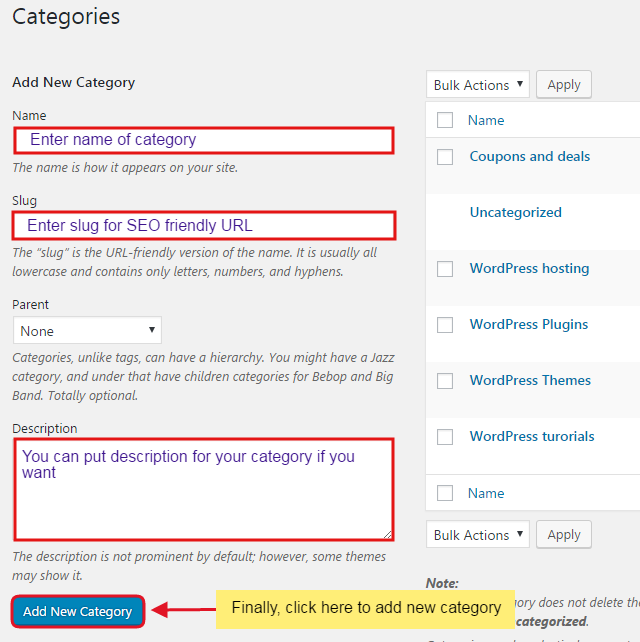 You have learned to organize your WordPress posts into categories. Hope the tutorial was helpful for you. 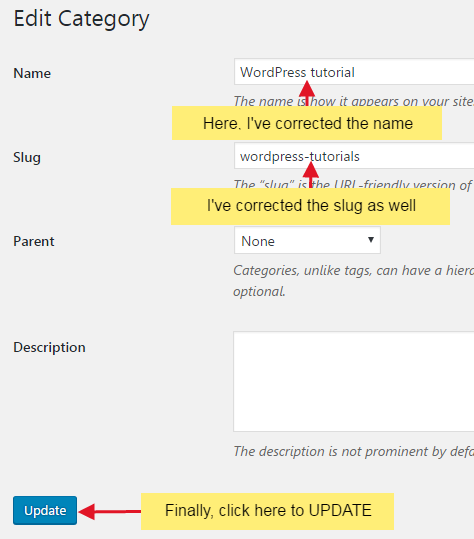 If you get any problem when you tried to organize your WordPress posts into categories, please leave a comment below. We’ll help you in the best way possible. Previous articleHow to change WordPress website’s title and tagline? 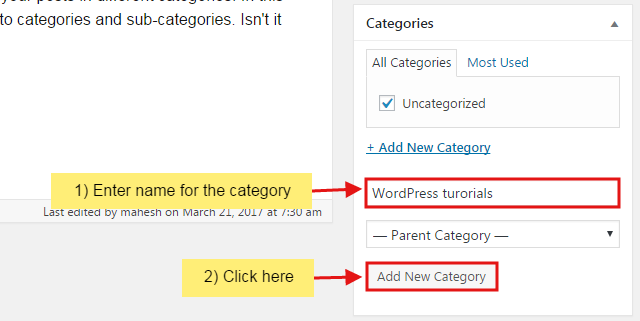 Hey Buddy!, I found this information for you: "How to organize your WordPress posts into categories". Here is the website link: https://wpallclub.com/organize-your-wordpress-posts-into-categories/. Thank you.